enemies. These bags, composed of silken threads and bits of foliage, look so much like a part of the tree that they may go unnoticed until extensive damage has occurred. Bagworms are common throughout the state. Early in June, the insects hatch from eggs which wintered in the old bags attached to tree branches. As soon as the young worms appear, they start to spin bags and continue to enlarge these as they feed and grow. The caterpillars crawl part way out of the bags to feed. If disturbed, they retreat safely inside, and it is almost impossible to pull them out. Each female bag can produce over 1,000 bagworms. Bagworms mature in late August or early September. At this time the bags are about 2 inches long and can no longer be killed by pesticides. The worms then attach the bags firmly to branches or other objects and change into the adult stage. The wingless female never leaves the bag and is fertilized by the winged male. The eggs are laid in the bag where they pass the winter. Eggs of bagworms located south of Monticello, Peru and Bluffton, or near Lake Michigan usually survive the winter. In other parts of the State, eggs can be killed during cold winters. There is only one generation each year. 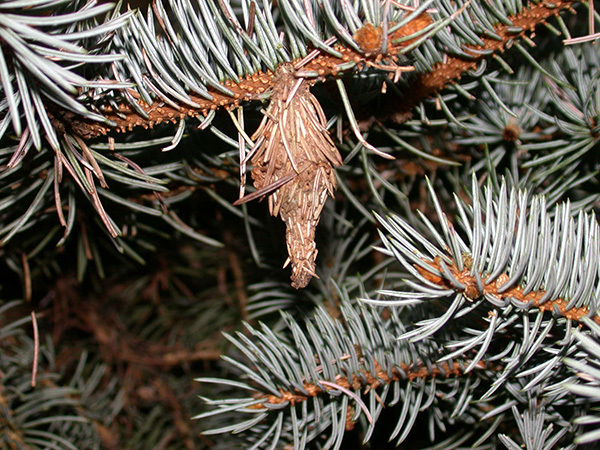 Bagworms tend to be a problem on trees that are isolated or in urban settings. When bags are found in the tree, simply pick the bagworms off and drown them in a bucket of soapy water. This method is most effective before eggs hatch out of the bags in June. 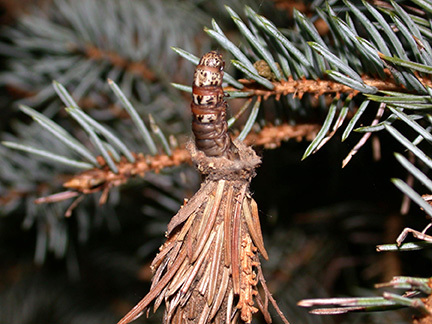 Bagworms can be controlled by spraying the foliage with insecticides after eggs have hatched and small bags are seen on the trees. Caterpillars must consume the foliage for the insecticide to kill them. For best results, use a biorational pesticide listed in Table 1. The biorational materials will kill the caterpillars without killing the natural enemies of spider mites and scale insects that can cause additional damage to the plant. 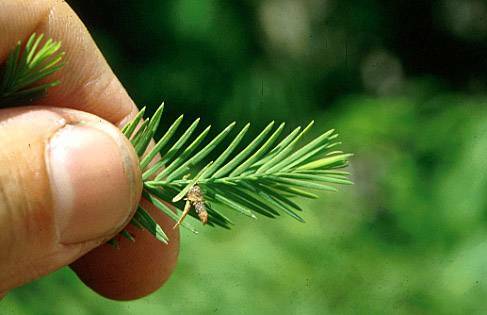 (See E-42-W Spider Mites on Ornamentals and E-29-W Scale Insects on Shade Trees and Shrubs). Caterpillars may have to feed on treated leaves for 1-2 days to get a lethal dose of these materials. In contrast, rescue materials can kill caterpillars feeding on the foliage within hours after application. All pesticides are most effective when directed against worms in bags that are still small. Dipel is only effective on bags < 1” long. Two weeks after any pesticide application look for live bagworms to determine if additional treatment is needed. Young bagworm covering itself with leaves. Alternatively, a soil application of dinotefuran may be applied to the base of the tree. Applications should be made in early May to allow enough time for this material to get into the foliage before eggs hatch. Our research has shown this product to be most effective on young bagworms on small evergreen shrubs. 1 1/5 cup 1/3 tsp. Fluvalinate (Mavrik) 2 F 5-10 oz. 2 tsp. - 1/4 - 1/2 tsp.